Features：ST type step up ＆ down transformer is specially designed for such electronic equipment whose rated AC voltage different from that of the local net voltage.They are safe for use within the rated voltage range. 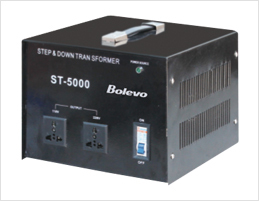 ST type step up ＆ down transformer is specially designed for such electronic equipment whose rated AC voltage different from that of the local net voltage.They are safe for use within the rated voltage range. This voltage converter can be used in 110 volt countries and 220 volt countries. It will convevt from 220-240 volt to 110-120 volt AND from 110-220 volt to 220-240 volt. Input voltage selector: 240V-220V-220V-110 volt. Suitable for Water Dispenser, Printer Rice Cooker, Fan, Fax Machine, Air Machine,Computer.